Ezra Pound's interest in Japanese poetry has long been acknowledged, but only as an eccentric sort of literary relation which has little understandable connection with his critical theory or his poetry. Earl Miner assures that Pound's interest in haiku aims at a partial explanation of his Japanese studies that enjoy a prominent place alongside with Latin and Provencal poetry. This one form of Japanese poetry has influenced Pound's theories of poetic imagery, and has offered him techniques, which have exfoliated into all his writing. Haiku is a short Japanese poetic form, which developed about the middle of the seventeenth century. It consists of seventeen syllables in three lines of five, seven, and five syllables. In order to transcend the narrow limits of their form, Japanese poets have evolved a style of condensation, ellipsis, suggestion, image, symbol and echoing of well-known older poems. These characteristics of style present a texture more tightly woven than the most eccentric metaphysical conceit. The possibility of haiku being easily understood by someone unfamiliar with the language and that culture is obviously remote. Yet what haiku has been misapprehended in our own day. However, the point is that significant poetry has often resulted from such partial understanding. It may be true in a sense that the misunderstanding of haiku is one key to our understanding of Pound's theories regarding the image and some of his poetry. Having no understanding of the language, and little knowledge of the culture, Pound's understanding of haiku has been confined to the imagistic technique and to the consideration and suggestiveness that are so much a part of the method of haiku. Pound and the other Imagists, who formed their theories of Imagism by taking into account Japanese art and poetry commonly regarded the image in a pictorial or a visual sense. This usually ruled out a conception of the image as an impression of any of the other senses and also precluded using the term to describe any merely metaphorical figure. Pound's interest in the Japanese is largely pictorial and this suggestion is strengthened by his writings on the image and confirmed by the most important evidence i.e. his own poetry. Pound has used the Japanese poetry as starting points and points of reference in developing his theories of the image. Pound has explained how haiku has entered into the process of composition of one of his best known poems "I wrote a thirty-line poem and destroyed it because it was what we call work of the second intensity. Six months later I made a poem half that length; a year later I made the following hokku-like sentence. Pound defines the technique which he had adopted "The one image poem is a form of super-position, that is to say it is the one idea set on top of another. This super-pository technique has clearly evolved out of Pound's knowledge of Japanese poetry, for he thought that he was imitating or utilizing the technique of haiku. Actually he has been using only one of the methods which haiku employs to overcome the limitations of its brevity. 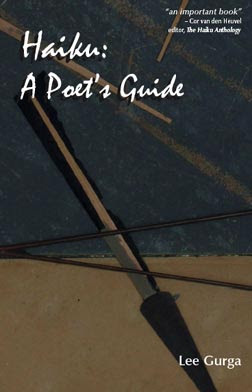 This leaves him open to the charge of inadequate understanding of Japanese poetry; however, it is enough to have a glimpse into the creative process as the poet seizes upon his subject, shapes it according to a technique learned from another literature and presents us with the finished object of art. The program which pound presents for Imagism is that its techniques are "Japanese" and its justifications are the excellence of Japanese poetry. Before casting the light on his modification of the technique of super-position in his poetry, we have to consider the role which haiku has played in the formation of Pound's theories about Imagism. In description of his experience, in the "metro" he speaks of the loveliness of "that sudden motion" and the discovery of "the expression...not in speech but in sudden splotches of color " This account may be compared with his famous definition of the image "an intellectual and emotional complex in an instant of time... It is the presentation of such an image which gives that sense of sudden liberation; that sense of freedom from time and space limits; that sense of sudden growth, which we experience in the presence of the greatest works of art." It seems likely that Pound quoted definition of the image is based upon his enthusiasm for haiku. Moreover, there is a continuity of the development of Pound's theories concerning the image. The definition, which was first stated in terms of an instantaneous perception transcending the boundaries of time and space, is broadened to mean on image or metaphor about which the meaning of a longer poem might cohere. There are various poems that present the haiku technique in Pound's poetry; we shall restrict ourselves in presenting one poem "Fan-Piece for her Imperial Lord" and portray the nature of Pound's use and misuse of Japanese techniques. You are also laid aside. As a haiku consists of seventeen syllables, this poem is made up of seventeen words and these in the haiku pattern of five, seven and five in three lines. Then we have a modified version of Pound's form of super-position through the narrative explicit statement "O fan of white silk...You are also laid aside." In addition, we have a super-posed image of frost on a grass blade. The title tells us that a wife or mistress sends the poem to an imperial prince, "her lord". The woman shows her tact and restraint by addressing the compliant to the fan instead of to her master. The nature of her complaint is made clear only in the last line with the shock of utilizing the adverb "also", we understand from that the woman has been deserted or forgotten. We must notice the importance of the super-posed image to this theme. The resemblance of the silk of the fan to the frost on the grass is not one only of color. The point is that the clear frost melts quickly in the morning sun, that beautiful fans are used by imperial princes for only a short tim, and that even a woman's beauty will serve as an attraction for only a season. Certainly Pound has achieved a poetic success in this lament or complaint. Imagery, rhythms and suggestions fuse to give a unified moving poem. However, this poem differs from haiku in various aspects. First, haiku are nature poems and exclude such topics as love complaints. Second, Pound's suggestion of the season (frost suggests autumn) lacks the over-riding importance of nature which is characteristic of haiku. Third, there is a difference in the meaning of the poem since it is restricted to psychological and esthetic truth and is void of religious symbolism which gives haiku a profound universality. What Pound's poem lacks is a centuries-old tradition of nature symbolism and a poetic practice to express it, as well as a language highly developed for brief, suggestive and allusive poetry. But what amazes us is the degree to which Pound has emulated the techniques of haiku and the skill with which he has reproduced the tone of melancholy and restrained the plaintive sense that is common in Oriental poetry but rare in Western poetry. White bulk under olives, a score for drawing down stone. "But in the pale night the small lamps float seaward,"
These examples familiarize a reader of Pound's poetry with the technique. It might be said that this form of super-position has been most found it useful to him in poems and passages which are elegiac or lyric; also Pound has found it useful to gather several lines of narrative and exposition into one opposite image. Such a survey shows that haiku has made an important contribution to Pound's theory and practice. It has given him material and examples for much of his theory concerning imagery, and a flexible technique which he called the "form of super-position." It is also assumed that he has been attracted by the suggestive, allusive, condensed and concrete qualities of Japanese poetry. The extraordinary aspect of the use of this technique lies in the clarity, the logic and the assurance with which its author developed and promulgated it from poetry written in a language he neither read nor spoke.